Edo poll: Buhari endorses ‘technocrat’ Obaseki, hails Oshiomhole | Welcome to Dare Lasisi's blog! 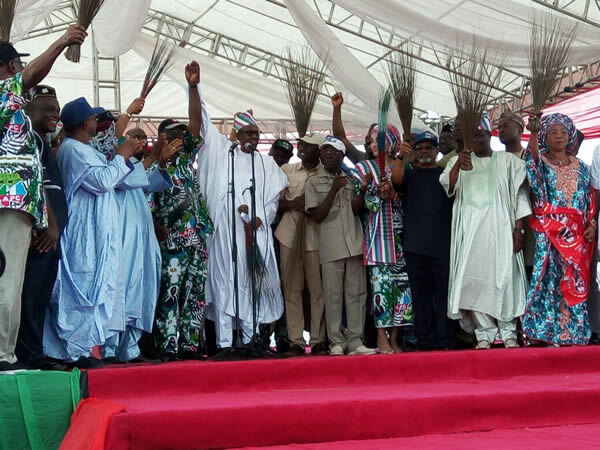 President Muhammadu Buhari has described the governorship candidate of All Progressives Congress in the September 10 election in Edo State, Mr. Godwin Obaseki, as a seasoned technocrat capable of governing the state. Buhari said this at the APC’s mega campaign rally at the Samuel Ogbemudia Stadium on Tuesday in Benin. “Obaseki is a seasoned technocrat and I recommend him to you so that you can continue to grow the state,” he said. The President, who said he had been invited to the state several times by Governor Adams Oshiomhole, commended the governor for his achievements in the state. “I am grateful for inviting me to come today to identify with you. “You have built schools and roads which I have seen myself,” he said. The President said the people of Edo State would do well by voting for Obaseki on Saturday, to sustain and continue with Oshiomhole’s good works in the state. He acknowledged the current economic challenges and assured the people that the nation would come out of the woods with the available human and material resources. Also, the President paid tributes to the late Oba Erediuwa, describing him as a foremost traditional leader with unquestionable integrity.